I am trying to calculate the difference between two LocalDateTime. I am pretty sure that the fields after the month value is coming wrong from my code. Any suggestion would be very helpful. I have tested my result from another website and the result I got is different. 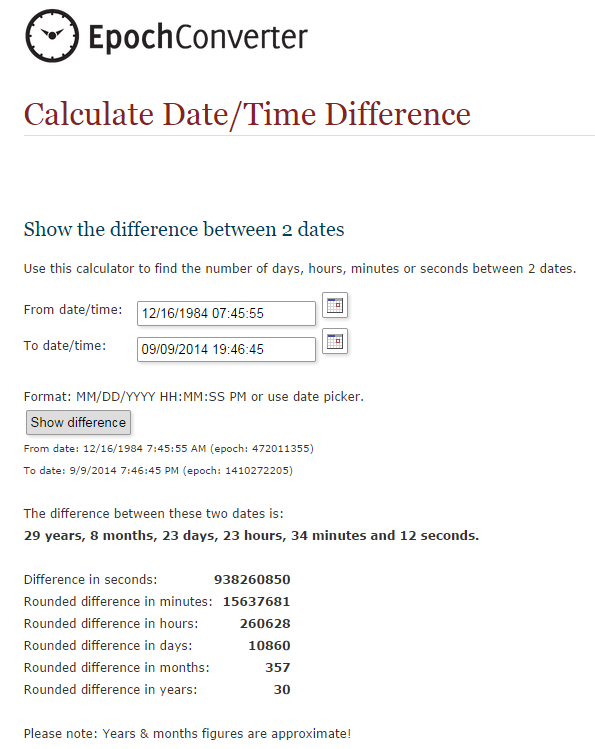 Here it is: Calculate duration between two dates (result: 29 years, 8 months, 24 days, 12 hours, 0 minutes and 50 seconds). Then the output is coming: 29 years 8 months 25 days -1 hours -5 minutes -10 seconds. From this link it should be 29 years 8 months 24 days 22 hours, 54 minutes and 50 seconds. So the algorithm needs to handle the negative numbers too. Note the question is not about which site gave me what result, I need to know the right algorithm and need to have right results. Unfortunately there doesn't seem to be a period class that spans time as well, so you might have to do the calculations on your own. //prints: 29 years 8 months 24 days 22 hours 54 minutes 50 seconds. The basic idea is this: create a temporary start date and get the full years to the end. Then adjust that date by the number of years so that the start date is less then a year from the end. Repeat that for each time unit in descending order. Finally a disclaimer: I didn't take different timezones into account (both dates should be in the same timezone) and I also didn't test/check how daylight saving time or other changes in a calendar (like the timezone changes in Samoa) affect this calculation. So use with care. I found the best way to do this is with ChronoUnit. Here a single example using Duration and TimeUnit to get 'hh:mm:ss' format. And the version of @Thomas in Groovy with takes the desired units in a list instead of hardcoding the values. This implementation (which can easily ported to Java - I made the function declaration explicit) makes Thomas approach more reuseable. At the time of this writing,the code above returns 47 Years, 8 Months, 9 Days, 22 Hours, 52 Minutes, 7 Seconds, 140 Millis. And, for @Gennady Kolomoets input, the code returns 23 Hours. Here is a very simple answer to your question. It works. it returns 0 years 0 months 1 days -1 hours 0 minutes 0 seconds. I think the right output is: 0 years 0 months 0 days 23 hours 0 minutes 0 seconds. I propose to separate the LocalDateTime instances on LocalDate and LocalTime instances. After that we can obtain the Java 8 Period and Duration instances. The Duration instance is separated on the number of days and throughout-the-day time value (< 24h) with subsequent correction of the period value. When the second LocalTime value is before the firstLocalTime value, it is necessary to reduce the period for one day. "Period between " + firstLocalDateTime + " and "
+ secondLocalDateTime + " is: " + period + " and duration is: "
All tests are successful whether or not the value of the first LocalDateTime is before and for any LocalTime values. Not the answer you're looking for? Browse other questions tagged java date datetime java-8 difference or ask your own question. In Java, how do I get the difference in seconds between 2 dates?